Ana Echevarría teaches Medieval History in the Department of Medieval History and Palaeography at the Universidad Nacional de Educación a Distancia in Madrid, and in the Graduate Program in the same Department. 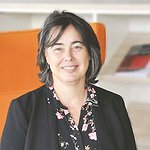 She was previously a Visiting Assistant Professor in the International Spanish Program at Madrid of New York University. She has been awarded fellowships and grants from different institutions, to conduct research work at Edinburgh University, UCLA, Rice University, the KHK and the Cluster of Excellence Cultural Foundations of Social Integration, University of Constance. She has published The City of the Three Mosques: Ávila and its Muslims in the Middle Ages (Reichert, 2011), awarded the International Prize for Research on the Culture and History of Al-Andalus by the Al-Babtain Foundation (Kuwait). Ana Echevarría studies the relations between Christianity and Islam in the Iberian Peninsula, with an emphasis on issues such as polemics, conversion and the situation of religious minorities under Christian rule. Her recent projects include a new focus on the assimilation of Christian communities by Islam in the Early Middle Ages, trying to set the Iberian Peninsula in a broader Mediterranean context. As a KHK Visiting Research Fellow 2018, she is going to work on a project titled Dhimma: The Status of Protection in a Mediterranean and Asian Context, for the Entangled Religions Handbook.